Before GW released multi-pose plastics alot of fantasy armies consisted of the same plastic model repeated dozens of times. 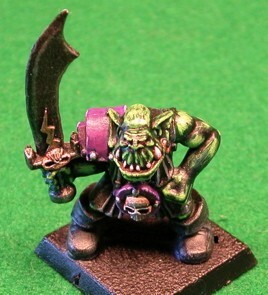 It is one of the reasons I never got into fantasy, the other was my friends prefered 40K. The old models may have a little less detail but that doesn't mean you can't get them to look just as good as the newer models. GW wants you buy new models because it makes them money. There is only at most one wash and two colors used in most of the highlights. A little of my tiny line style is used but not much. I try brushed the metallic bits and the black cloth portions.